Abstract: High-order harmonic generation (HHG) is a strong-field phenomenon, where a valence electron in gas medium is tunnel ionized by the strong femtosecond infrared (IR) light field and then recombines to the parent atom after acquiring high kinetic energy from the acceleration by the electric field. The photon energy emitted in the HHG process is given by the ionization potential plus the kinetic energy of electron, corresponding to the extreme ultraviolet (EUV) and soft X-ray (SXR), so-called XUV, range. The HHG process occurs every half cycle of driving laser field and thus produces highly coherent EUV/SXR pulses in sub-fs durations. It has opened up the research on experimental attosecond science. The superb spatial and temporal coherence of harmonic pulses is also very beneficial for many applications, such as interferometry, coherent diffraction imaging, full-field imaging, and phase-contrast imaging in the XUV range. The driving wavelength of HHG determines the basic spectral structure as well as the conversion efficiency of emitted XUV lights. Femtosecond high-power Ti:sapphire laser amplifiers at 800 nm of wavelength have been the workhorse for the HHG research since early 1990s. The driving wavelength of 800 nm limits the harmonic cutoff to ~150 eV with conversion efficiencies of 10^-5-10^-7. Recently, long-wavelength-driven HHG has proven to be a promising way of extending the cutoff to the water-window (280-540 eV or 2.2-4.4 nm) and even to the keV regions. However, the longer driving wavelength increases the quantum diffusion of electron wavepackets during the recombination and dramatically decreases the conversion efficiency. Therefore, the excellent phase matching between the IR and XUV pulses is very important to maintain good efficiencies. In this talk, a HHG-based table-top coherent SXR source will be presented. The presentation will cover the wavelength scaling of HHG and the driving laser technology for the long-wavelength-driven high-flux HHG in the water-window SXR range. The source laser technology includes a 2-um, high-energy, femtosecond optical parametric chirped-pulse amplifier operating at a kHz repetition rate and a novel picosecond pump laser based on cryogenically-cooled Yb:YAG gain medium as a key element for the high-energy 2-um system. The experimental and theoretical HHG study using the 2-um source will be discussed in terms of the cutoff and efficiency scaling and high-order harmonic spectroscopy. We believe this SXR source can ultimately compete with large-scale accelerator-based X-ray free-electron lasers in near future for its compactness and accessibility. Recommended reading before the seminar: "High-order harmonic generation of Xe, Kr, and Ar driven by a 2.1-µm source: High-order harmonic spectroscopy under macroscopic effects", Kyung-Han Hong et al., Phys. Rev. A. 86, 043412 (2012) available for free here (http://arxiv.org/ftp/arxiv/papers/1209/1209.1773.pdf) and (http://pra.aps.org/abstract/PRA/v86/i4/e043412) (paywall). 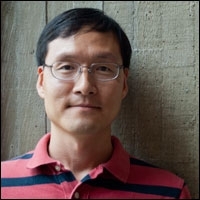 Biography: Dr. Kyung-Han Hong is a Principal Research Scientist and Principal Investigator of MIT Research Laboratory of Electronics, and is working with Prof. Franz Kaertner in Optics and Quantum Electronics group. His accomplishments span a range of topics in ultrafast laser science. His research has focused primarily on the ultrashort pulse amplification and its application to high-field physics such as high-order harmonic generation and relativistic optics. He is also active in a wide range of ultrafast optics research topics such as ultrashort pulse generation and measurement techniques. Dr. Hong authored and coauthored 65 peer-reviewed SCI journal papers, more than 120 international conference papers, and 6 patents. He is a regular reviewer of scientific journals, such as Optics Letters, Optics Express, Applied Optics, and Optics Communications. Dr. Hong was educated at Korea Advanced Institute of Science and Technology (KAIST, South Korea), where he completed his B.A. (1996), his M.S. (1998) and Ph.D. (2003) degrees, all in Physics. After his Ph.D., in 2003 and 2004, he did postdoctoral work at the University of Michigan under Prof. Gérard Mourou. Dr. Hong had been a Senior Research Scientist at the Advanced Photonics Research Institute, Gwangju Institute of Science and Technology when he joined MIT in 2007. Since then, he has demonstrated many of the key technologies central to the high-flux HHG-based table-top soft-X-ray source. Before joining MIT, he developed TW- and PW-class Ti:sapphire chirped-pulse amplification lasers, and high-repetition-rate Ti:sapphire amplifiers. His contribution in the laser application includes the demonstration of the most efficient HHG, the stable electron acceleration in a laser-plasma wakefield up to ~1 GeV, and soft X-ray lasing in a grazing-incidence geometry.